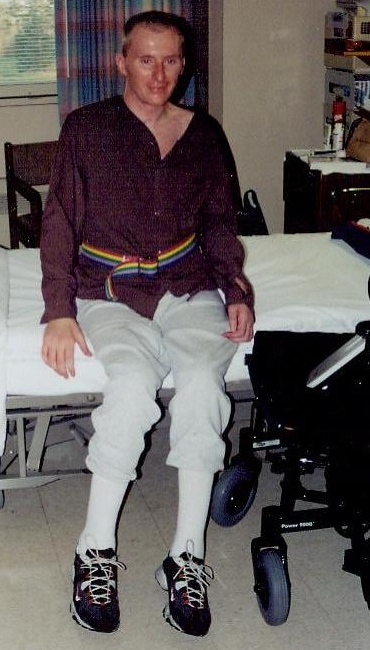 Here are a few photo's showing the progression of my recovery from Guillain-Barre Syndrome. They aren't very flattering pictures, but they give you an idea of the recovery process. Here I am shortly before coming down with GBS. I was in the service when I came down with GBS. 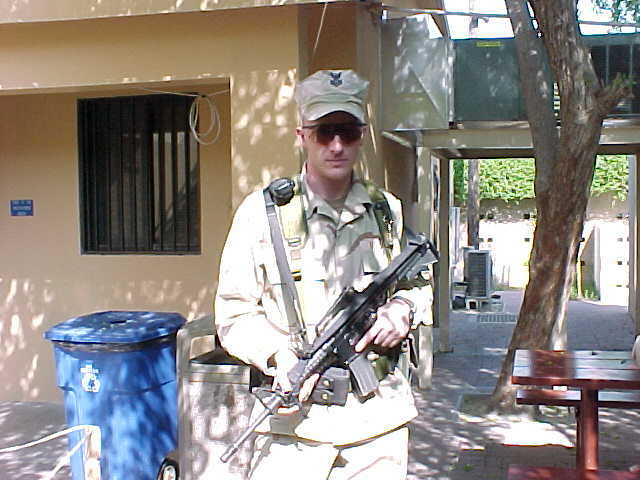 This photo was taken in Bahrain a year and a half before I would come down with GBS. 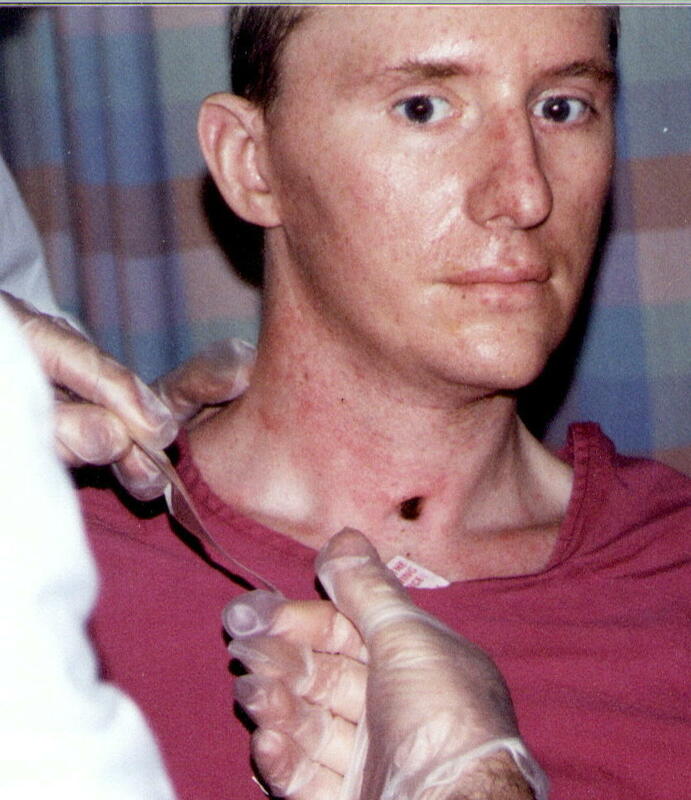 Here is the photo that was taken when my peg tube was inserted. Isn't technology amazing? I received all my meds, nutrition, and water through this tube for a long time. Near the end when it was supposed to finally come up we had lots of problems with it leaking because it was worn out. The finally ended up putting a clamp on the thing to keep it from leaking out. 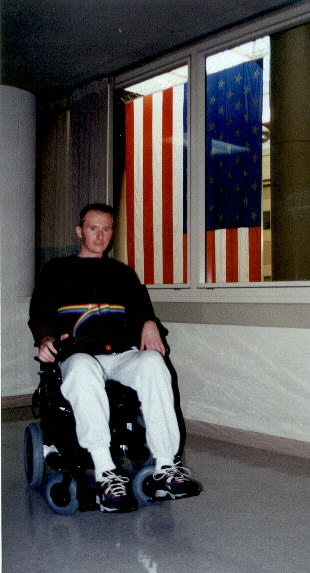 At the Kansas City VA and recently weaned off of the vent. My nurse (Leslie) and PT (Karen) took me out for some fresh air along with some family. 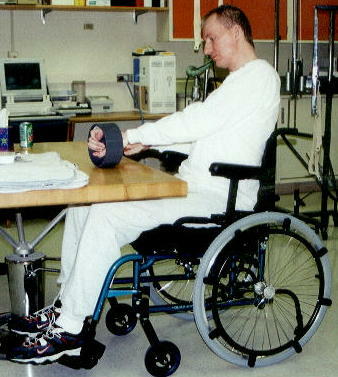 Working on building strength and range of motion by using the "skate board" at the Minneapolis VA. It looks simple but when I first started just a few minutes had me worn out! Strapped into a tilt table bearing weight for the first time in months. Still have my trach in if you look. 3 minutes was all I was able to stand my first day upright. 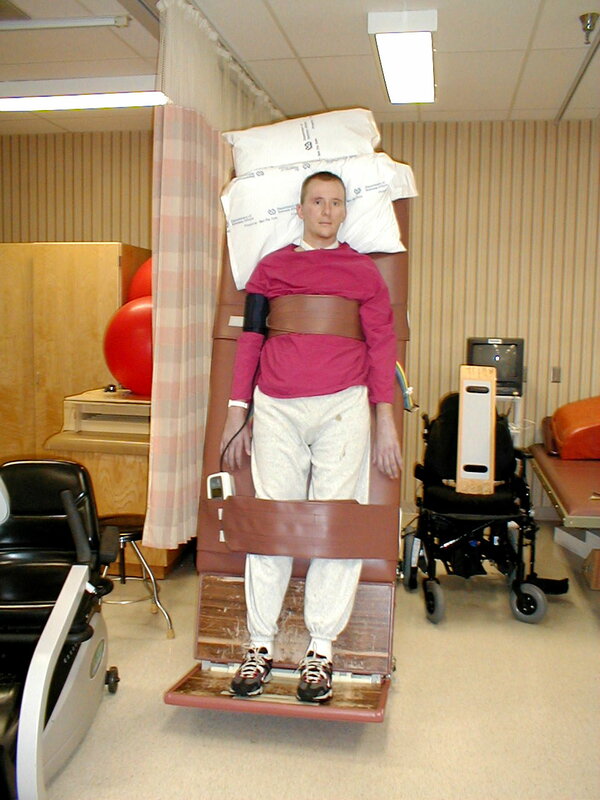 As that table tilted upwards and my body weight shifted against the straps I felt a little anxious because I wasn't able to shift my weight backwards; I was completely supported by those straps. Getting ready for my first shower in 4 months. The PEG tube is still in. That was a WONDERFUL shower. The feel of running water on my body was the most amazing thing! My trach finally coming out, it had been in for over 4 months. Look at that hole! Seer how skinny my face is? I was 50-55 pounds below my normal weight at this point. Working on upper body strength with Kory (OT) and Jen (OT) cheering me on. This should have been such a simple thing, yet it took nearly a month to get it done. PT students Jay and Eric help me roll onto my side. The pulley helped me to get more range of motion in my arms and shoulders. I've put several miles on this thing. Here I had just enough return in my arm to operate an electric chair. I still had to be transferred in and out by nurses. I was told that the flag in the back ground measured 30'x50'. 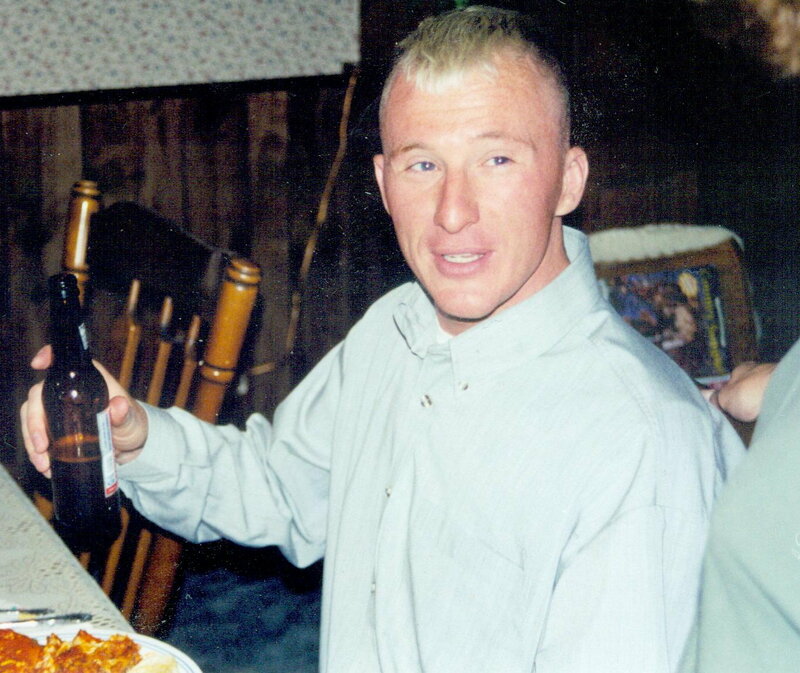 This was taken about a month after 9-11. This is a lite gait. It supports all of your weight and allows you to take steps. I was told that not many rehab units have one. 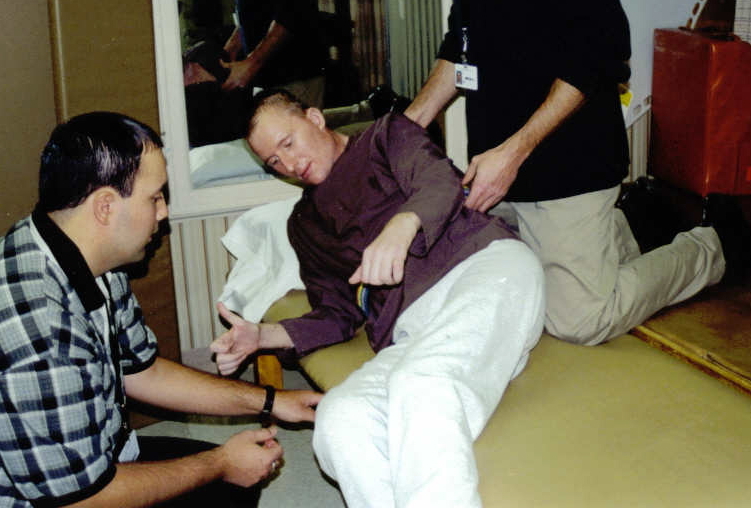 Occupational Therapy in a manual chair. Because I had no grip strength this chair was modified for me. See the wheels? This chair is a Quickie. FINALLY taking steps on my own with the use of a walker in Physical Therapy. Jay is standing by to catch me incase I need a hand. Here George and I shoot the breeze. We came off the vent about the same time, and even had our PEG tubes pulled on the same day. Hey George!!! 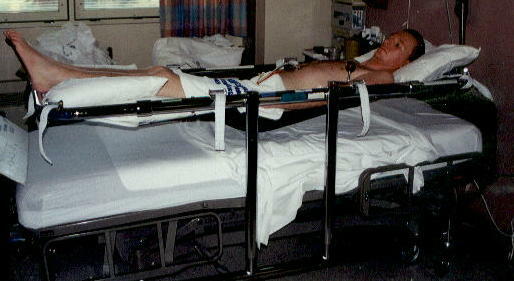 I had to learn how to transfer into a car from my wheel chair before I could be discharged. Jay is helping me here. 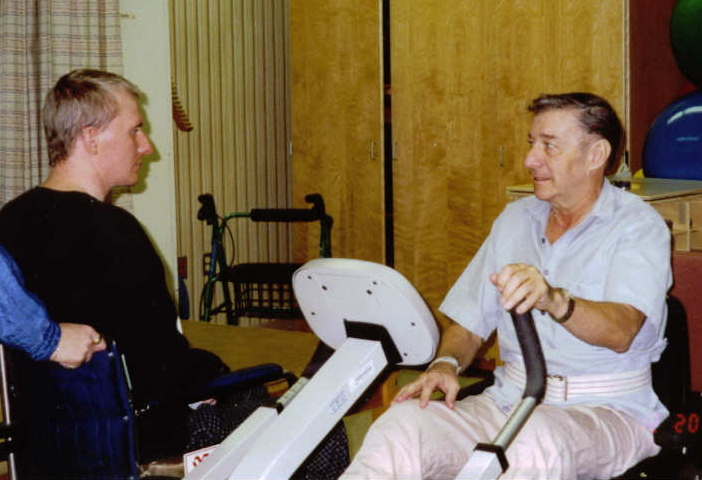 There was an actual portion of a car set up inside the hospital where transfers could be practiced within a controlled environment. Here you can see the braces I still use to prevent foot drop and the grip exerciser laying on the bed. I still had to use the crutches Donna has. 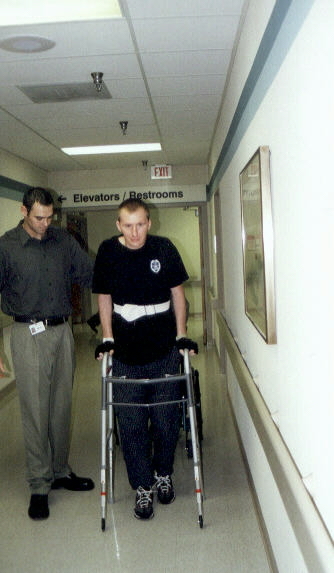 Here you can see me making my way down the hall with my fore-arm crutches. 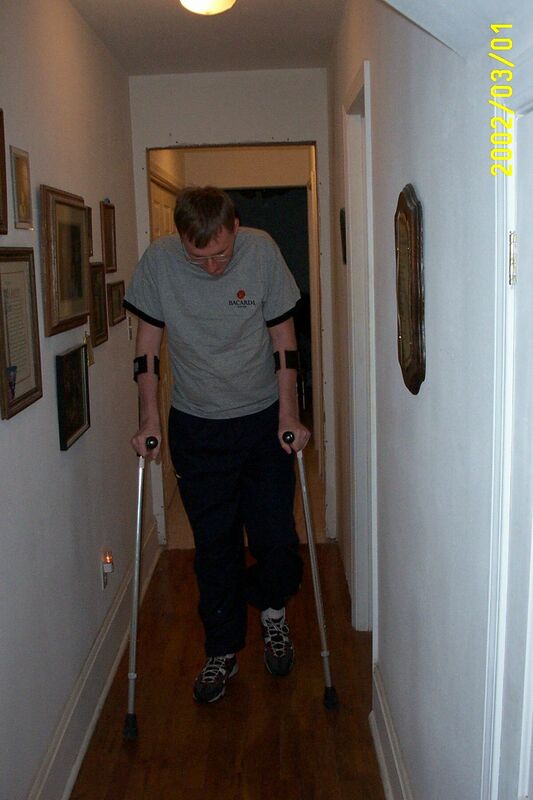 Back home and getting around on fore-arm crutches. 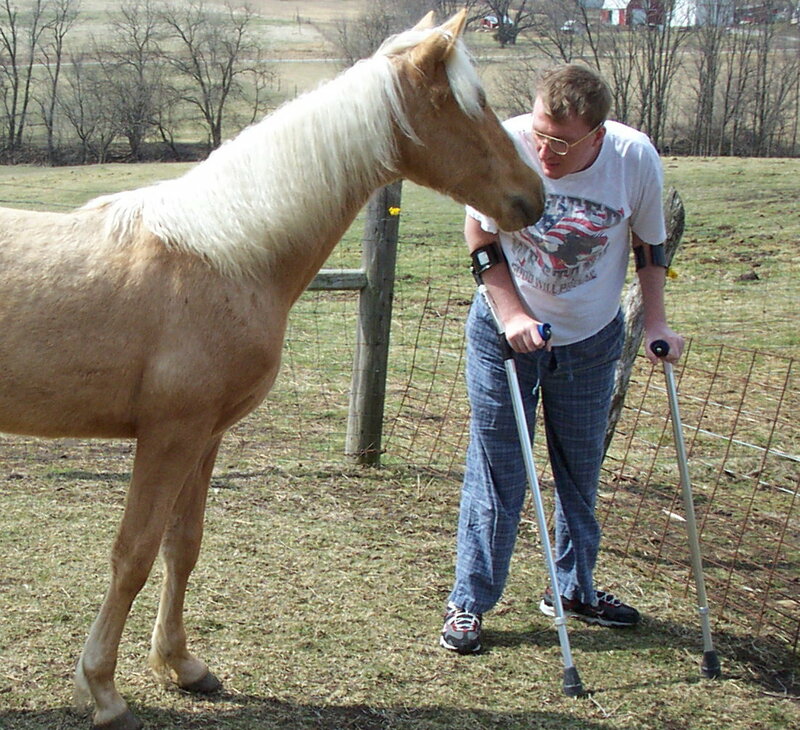 Mom's yearling was checking me and those crutches out. Because I don't have complete return to my hands I still have difficulty with buttons and zipper. These bibs are easy to get on and off. Yes, I have put all the weight and a few extra pounds back on again! Here are my new AFO's. They are hinged and make activities such as walking and riding a bike much easier. This is a knife that I got when I could not hold a regular knife in my hand and cutting my food wasn't possible because of my weak grip strength. I am not sure where it came from because someone got it for me, but it was terrific! I recommending this knife or one that is similar. 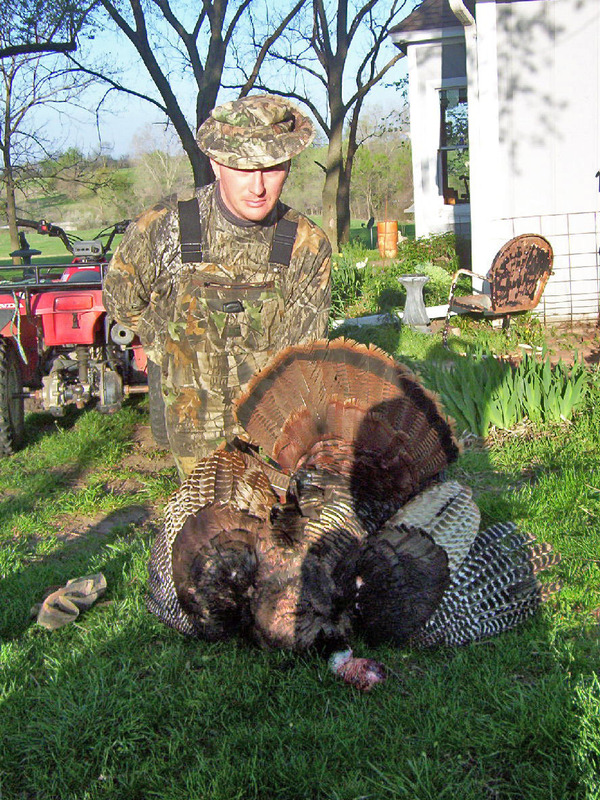 Here I am with a turkey that I took during the spring of 2004. I've come a long ways to be able to tromp around in the woods to take this wild turkey! I still depend on my AFO's to get around, but I am out and about again.